Daniel Rainn Bilson Dot Print Pleat Detail Blouse I pinned this exact blouse, so I was ecstatic when it arrived in my fix! I knew before I even tried it on that I would be keeping it! It's perfectly feminine, with the white tank you see underneath being built in. This is now my favorite piece in my closet! Those buttons make it nursing friendly, so I may just wear it every day! I was not a fan of this at all. The sleeves are a bit strange, and the hood didn't seem to fit with the style at all. Sorry this picture is so horrible and barely even shows the hood or side buttons, but really just pass on this one! This dolman top was just okay. I didn't love the fabric, and I thought the bottom was a tad too fitted. It was a very pretty shade of blue; however, you could not wear it with dark denim otherwise you would be a blue monster. I love how it complimented my heather gray shorts though. This is the first piece of jewelry I have received from Stitch Fix, and I liked it! 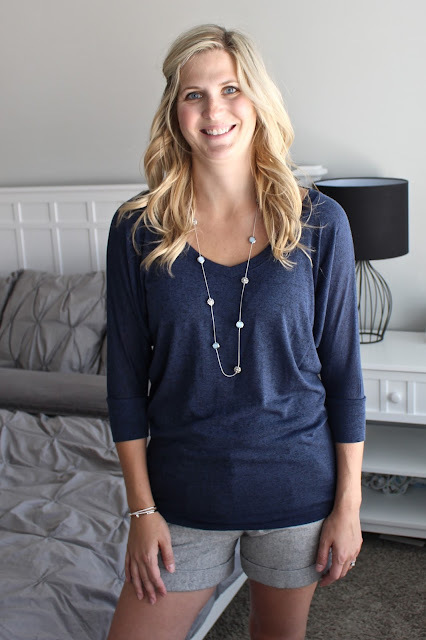 My stylist thought it would complete the look with the Dolman top, and she was right! It's a perfect length & subtle but pretty! If I wasn't so obsessed with the dot print blouse, I may have kept this! If you still haven't tried Stitch Fix, you really really should! Join the cool kids! And if you use my link, I will thank you thank you and thank you forever! It was a pretty awesome fix! I'm still waiting for the one where I want to keep it all!!! I really like a lot of what they sent you! I actually could see the Hooded Poncho being pretty cute with boots and skinnies in cold weather. And, I have to ask, did you have someone take your pictures or did you use a tripod? 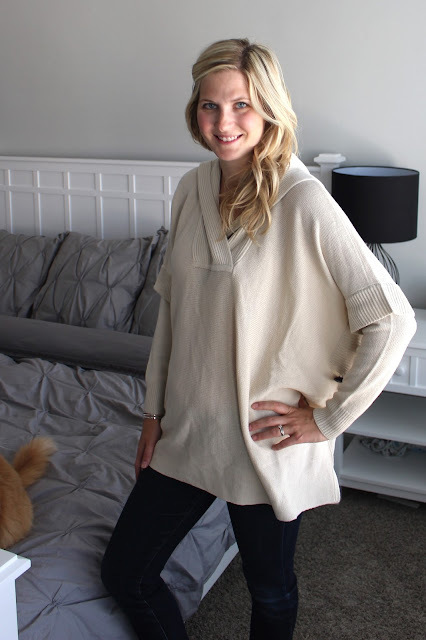 Okay I am LOVING the split neck tunic on you!! Did you decide to keep it?! Loving the Fall vibe of these clothes... my favorite season in Utah! I'm going to miss it SO much! Ooh I love the first shirt but think I'd would have kept the tunic as well... It's gorgeous on you! That sweater really was bizarre! That dot print!!! Seriously amazing. Love how soft & feminine it is. That tunic is also pretty snazzy. I love the fit of it. If the color isn't quite you, I would send it back though. Definitely don't want it just hanging out in your closet. Ugh, I really do need to try this. It looks so fun, I'm just worried I'm going to love everything and keep it all and spend way too much money, ha! The top you kept is adorable! WTF is up with those sleeves on the poncho..?!?! HA!! Yes, love love the dot/pleat blouse. so apparently i need to schedule a stitch fix right now and if they don't send me the first blouse and that tunic i will go crazy. seriously, so cute. meanwhile, the white top with the built in tank - is it like legit built in or is it 2 separate pieces? i hate the ones that are separate pieces. 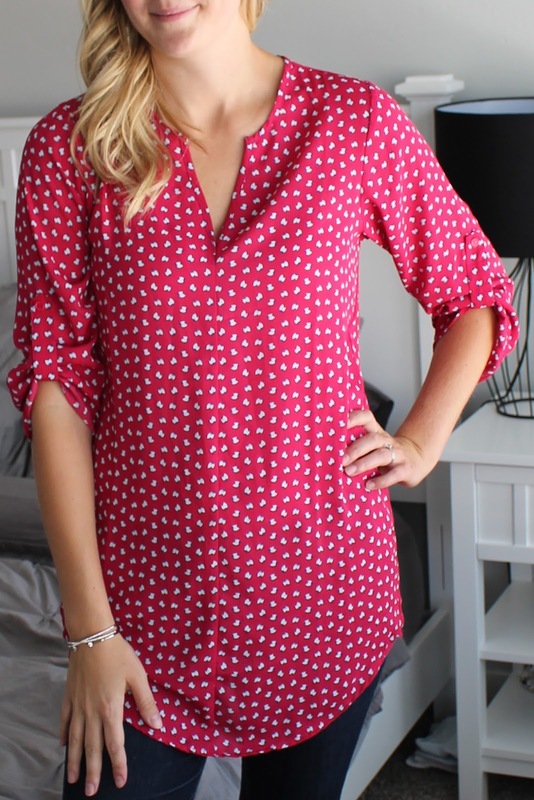 I love that dot blouse!! Okay, that's it! I may have to try Stitch Fix! You look absolutely adorable in all of those shirts! Do it! Hopefully you will love it!